Campaigners outside 23 Alderbrook Road. A ‘GARDEN grabbing’ development in Solihull has been quashed by the High Court. 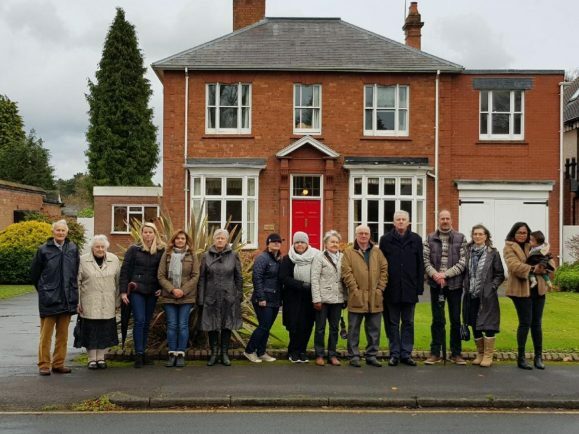 Plans to demolish 23 Alderbrook Road, build five four-plus-bedroom houses onto the back garden and extend number 21 were given approval by Solihull planning chiefs last October. However following a ruling by the High Court in Birmingham, it looks as though any such plans would have to go back to the committee. Campaigner Fiona Somerville challenged the committee’s decision claiming it went against Solihull Council’s Local Plan. A judicial review found the policy P5 of the Local Plan was incorrectly interpreted. It looks at protecting and enhancing the character and distinctiveness of different areas, and protecting the environmental quality and attractiveness of the mature suburbs – established housing areas in the borough. The court also ordered Solihull Council to pay Ms Somerville the costs of the application in the agreed sum of £8,554. Ms Somerville said: “I am delighted with this landmark decision which will hopefully encourage Solihull Council’s planning department to put in place procedures to ensure lawful decisions will be made in the future on all planning applications. Solihull Council said: “Planning permission was granted on October 5 which included demolition of a dwelling and a ground floor extension and permission to build five new houses. “The planning permission was quashed following a successful judicial review challenge on the grounds that the Council’s Local Plan policy P5 ‘Provision of Land for Housing’ was incorrectly interpreted.